Tank Commanders in the Philippines! It's our third week of the Cafe Tank Wars Tournament! Are you itching to sign up and compete against other teams in the country, but haven't had the chance to yet? Check out our newest round of venues to see if your city is hosting this weekend! Want to know more about this tournament? Click here to read all about it. The Qualifiers for the 3rd week will be held in four seperate locations. A few of them have yet to play host to our tournament, so if you're staying in the area, this is your chance to participate! If your city isn't on the list this week, don't fret - just check back again next week for a new batch of venues. You might get lucky! Note: Some of the venues below contain two timeslots. The one from 10AM - 1PM is reserved for the Cybercafe Challenge (another WoT event unrelated to the tournament). If you're interested, come over earlier and get some training! Again, attendance for the Cybercafe Challenge is NOT compulsory to join the tournament. For more details regarding tournament registrations and pre-match information, please click here. The Cafe Tank Wars Tournament is an event specially organized for players who prefer to play in the cybercafes near them. Beginning with an on-ground Qualifiers for the first stage and followed by the Playoffs and Grand Finals (which will be held online instead), this tournament will offer players the chance to compete in a regional tournament while giving them the luxury of remaining in their neighbourhood. With an attractive prize pool to win and the chance to be known as one of the best players in the Philippines, We're putting out the call for all interested parties to join in! The tournament itself consists of three main phases: the City Qualifiers, the Playoffs and the Grand Finals. Starting from this weekend onwards, the tournament will begin with the City Qualifiers, where players based in several cities will assemble in the venue, register their teams and be seeded into matches against rival teams from the same city. One thing to note is that players are not required to be in a team before the arrive at the venue; if you wish, you can find your future brothers-in-arms at the place once you get there and sign up as a group. The City Qualifiers will also be held in a different set of cities each week, so if your city didn't make the list today, just be patient, it might come up next week, or the week after! At the end of the day, the best team in each city will be recognised as the city's Cafe Tank Team, who will play in the next stage: the Playoffs. 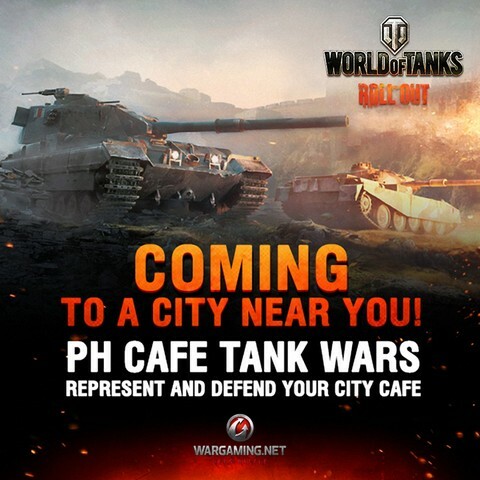 The City Qualifiers will continue selecting each city's Cafe Tank Team until it concludes in early June, when the Playoffs will begin. During the Playoffs stage, the teams will be seeded according to the tournament brackets, and will square off against one another. The ones that remain victorious will proceed towards the Grand Finals of the tournament, and vie for the title of Champion. Players must form a team of 7 players, representing any local internet cafe from their respective cities. Their team name should be the name of the internet cafe they are representing. Players can register their team on the day of the qualifiers in their city. All tournament matches will be based around 7v7 game modes, featuring a maximum of Tier 8 vehicles. Each team will be allocated 42 Tier Points to spend for all 7 vehicles. The City Qualifiers, Playoffs and Grand Finals will all be held as 'Best of 3' matches. For more information about the tournament rules and regulations, please visit this link.